Chris Dore is one of New Zealand’s top guides; specialising in the south of the South Island of New Zealand. He has a a very refreshing attitude to fishing and fly tying – and ‘keep it simple’ seems to be his watch-word. But making things simple requires a lot of knowledge and experience – Chris has a heap of both. Chris ties these ugly brutes for early season headwaters on size 6 to 10 long shank hooks ( I think I will use Tiemco 200R to give a slight bend). The rest you can pretty much work out for yourself. Wrap some lead (or substitute) around the hook, tie in a bunch of black hair or fur for a tail, tie in copper (or gold?) wire, and some black flexi-body or any stretchy sheet, dub up to 2/3 with hares ear, then some black dubbing, for thorax and head. Pull the back over the fly and tie down at the head. (Quick tip: before you cut off the back, pull the excess back towards the tail and throw in a few ‘locking turns’ to really secure the back). Follow with the wire to form segments, and tie off at the head, whip finish and give it a dab or two of head cement. Simple. Quick. Done. I suggested adding some wriggly rubber legs – Chris said he used to, but now does not bother because the fly is just as effective naked. Simplicity again. Chris describes the fly as his ‘get noticed fly’, to fish in edge waters and boulder runs. Go easy on the lead, you want the fly to move through where heavier flies would snag. That is about. I will be tying up a bunch of Creepers and Glister Nymphs for a trip to the central North island in early October, as Spring gets into full swing here. I have just read Charlie Craven’s latest book, and yet again it is a superb piece of work. 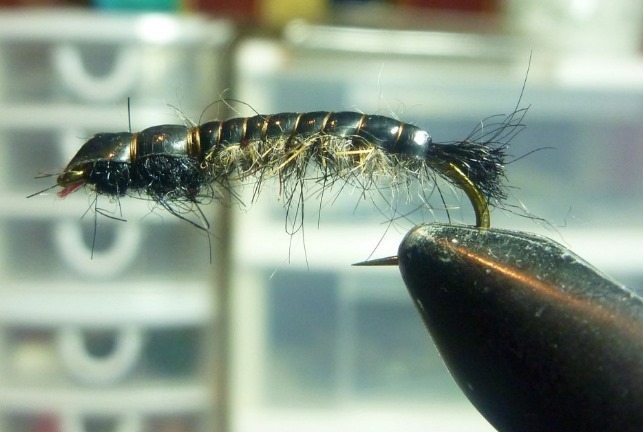 The extremely high standard of the fly tying tutorials, both in terms of the writing and photography makes the construction of the flies very easy to follow. While it is probably true that none of the flies in the book are truly new, it is also probably true that most ‘new’ flies are variations on a theme. In Charlie Craven’s case it is the value of the innovative materials he uses to construct his flies and the equally innovative tying methods he demonstrates, that sets the book apart from others. I defy even experienced fly-tyers not to learn a good deal from the pages. I cannot recommend this book highly enough. You can get it at Amazon. 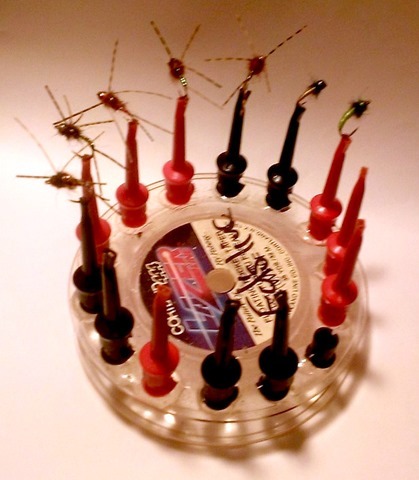 One of the more irritating features of fly-tying is the mess that can be created by the cut, hacked, sliced and diced bits of fur, feather, wire, thread, and more. The mess invades the fly-tying desk and the floor. All guaranteed to create disharmony in a previously happy home. I have tried all kinds of proprietary gizmos to capture the dross – typically expensive, invariably pretty much useless. But I have come up with a cheap and effective demessifier, that takes seconds to make. 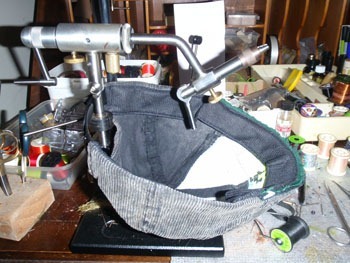 Grab an old baseball cap, cut off the peak, undo the clip at the back of the cap and place it around the stem of your vise. Job done. That is it – harmony returns to your desk, floor and home. Beaut eh! There are in this fishing world of ours thousands of hints, tricks, and tips to make things easier or more effective. Most of us I guess read them, say to ourselves, ‘now that is a good idea, I must use that’ – and promptly forget around 99% of them! Well a couple of months ago I read a tip in a UK fly-fishing magazine that was simplicity in itself, designed to solve a problem that affects us all, sometime or other. So there I was on a nice piece of water, catching a few nice trout on a new fly I was trialling, till one a bit better than my skills took it away. So I opened my fly box and the other one of the two I tied fell into the grass at my feet. Do you think I could find it – no chance. Now back to that tip that drifted out of my memory when I was not looking. Simply tie a small but powerful magnet onto a length of string, and when you drop a fly ‘troll’ the magnet around the area where the fly fell. Beautiful – but forgotten. So no magnet, not string, no fly. Bugger. OK, so just when I needed it, the magnet on a string tip snuck back into my memory. But as I said no magnet, no string. But I finally thought, my landing net is tied to a magnet, that connects to another magnet attached to the loop behind my neck. I detached my net and slowly ‘trolled’ the magnet through the grass at my feet, and a fly attached itself. Actually not my fly but a well trampled previously dropped specimen by someone as clumsy as me. I can report that I did find my fly – but also have to report that despite the fact it’s brother caught a number of fish, the ‘lost’ fly failed to live up to the promise of the former. Still I did manage to cement the magnet tip into my brain cells, and at my age that is a good capture in itself. Postscript: If you tie flies, the magnet on a string tip has another use. When you drop a hook on the floor, as you do, especially a carpet covered floor, and more especially the dropped hook is small, a magnet on a string finds the little blighter quickly.